Looking for a Miss Selfridge student discount? 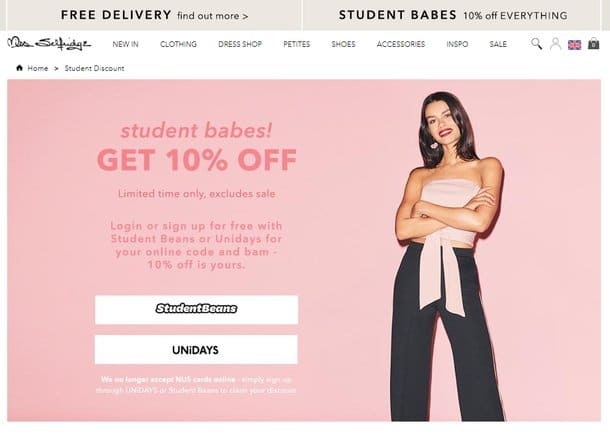 We can confirm that there is a Miss Selfridge student discount in 2019 for both online and in-store purchases. The standard reduction is 10% off although there are limited periods throughout the year when this is increased. To get the discount code students should go to this page on missselfridge.com and follow the instructions. If you need more in-depth details and all the terms and conditions then see chapter 1 of this guide which will answer all your questions. Go to this student page on missselfridge.com. If you an in a Miss Selfridge store you can also get a student discount. According to their website, you Just show any valid student id or you can show your Unidays or Student Beans code if you have it on your phone. The 10% discount will then be applied. But the savings don’t stop there, did you know that it’s possible for students to save even more at this wickedly fun store! We get asked a lot of questions about the Miss Selfridge student discount so we thought we’d write this Frequently Asked Questions chapter to give you the answers! Yes it does. The usual amount is 10% off and is available both online for and in-store in the UK. Is there a Miss Selfridge student discount code for online purchases? Yes, a student voucher code is available. Students need to go to the dedicated page on missselfridge.com and verify their student status. They will be then issued with a promo code which lasts for 30 minutes. Is there a Miss Selfridge Unidays code? Can I get a student discount in-store? Students can get a discount in-store at Miss Selfridge. They need to provide either valid student id (such as a NUS card) or you can use your Unidays or Student Beans code if you have either respective app on you phone. I’m a school pupil. Can I get a discount? School pupils can get the 10% off in-store if they show valid student id. For missselfridge.com the online voucher code is generated through Unidays and Student Beans. Is there any other ways for students to save money? Yes there is. Please see our next chapter which will explain all. We said it before and we’ll say it again make sue you claim the Miss Selfridge student discount code! It’s easy to get, easy to use and easy to get discounts on your lovely lingerie and toys. Check out our first chapter for full details and you can get it direct at misselfridge.com. This is a great little tip to get a student discount busting 20% off for one time only. If you sign up to the Miss Selfridge newsletter then you’ll get a 20% promo code to use one time only. The newsletter itself is also packed with offers and the latest new fashion from Miss S so well worth doing. 3. Are there any other Miss Selfridge Discount Codes? Did you know that Miss Selfridge regularly release promo codes for everyone to use throughout the year? They are for a limited amount of time only and have some good discounts such as 20% off and even 25%! Once they’ve expired you can’t use them. But we love them as they are super easy to use. How do students get them? Just look at our savings section at the top of our page where we list the latest valid voucher codes. A great way to bag a bargain is take a look at Miss Selfridge’ very on special offers page. It’s a gateway page where all the deals, sales and offers are promoted. If you’re not sure exactly what you want to buy it’s a great place to start and we also liked the helpful bra size or clothing size filters that can make finding gorgeous lingerie easy peasy. Speaking of which our Squirrel savings section not only has promo codes but lists the latest Miss Selfridge sales, offers and deals. This is regularly updated and all you have to do is click through on the big colourful button to bag that bargain. Miss Selfridge sells both online and in bricks-and-mortar high street stores, as well as through Outfit outlets alongside other brands owned by its parent company, Arcadia Group. There are currently over 170 stores in the UK of varying sizes, as well as shops in the US, Egypt, Chile, Thailand, Saudi Arabia, Kuwait, Australia, Bahrain, Israel, Ireland and Malta. Always fashion forward, Miss Selfridge frequently uses supermodels and the hottest of celebrities (most recently, the Kardashians) to work with them on high street campaigns that they otherwise may not consider. The current Miss Selfridge range spans jackets, tops, t-shirts, trousers, knitwear, skirts, dresses, loungewear, lingerie, beachwear and swimwear, as well as accessories and shoes. Sizes start at a UK 4 but there’s also a petite range for shorter women. There’s no plus-sizes as such, but their sister company Evans is well stocked for this range of customers. Online, you’ll find additional collections include bridesmaids dresses, formalwear and prom dresses. These can be ordered and returned for free, so even though you’re not able to pick them up in a shop, you can try them on and change your mind with no hassle. The Miss Selfridge website also frequently hosts sales of items unsold in stores – so before you buy, check online to be sure you’re not missing out on a bargain! Like many retailers, Miss Selfridge’s student discount varies. Here at Student Discount Squirrel we make it our mission to track down discount codes, vouchers and offer events: so make the site your homepage and peruse before you purchase to ensure you get the best possible price. Miss Selfridge has a fantastic range of en point fashion. From dresses to tops, jeans, shoes, accessories and a whole host more, there is lots of choice and fortunately at pleasing prices. Plus, with a Miss Selfridge student discount there are extra savings to be had for all you savvy learners. Miss Selfridge started life in 1966 as a plagiarised concept when the owner of Selfridges, Charles Clore, travelled to New York city and saw a window display for the Miss Bonwit young-fashion section of Bonwit Teller department store. Returning to the UK and implementing the same in his own shop, Miss Selfridge was born. Aimed at teenage girls, the first of Miss Selfridge’s mannequins were based on then-model Twiggy and her iconic mini skirt. The first collection of dresses for the store were made of paper; designed to be worn once and then thrown away! Couturier Pierre Cardin was commissioned to design quarterly collections for Miss Selfridge, and the brand quickly gained consumer attention. By 1969, Miss Selfridge appeared as concessions in department stores across the UK, with some independent shops opening on high streets alongside them. Models including Kate Moss, Yasmin le Bon, Tess Daly and Nicolette Sheridan all appeared in adverts for the brand before they became famous, and it wasn’t until nearly thirty years later than Miss Selfridge really hit the big time. In 1999, Sir Philip Green’s Arcadia Group purchased Miss Selfridge, to run alongside its other fashion brands including Topshop, Topman, Dorothy Perkins and Evans. This saw Miss Selfridge expand again into small concessions within Topshop stores and into Outfit outlet stores on retail parks, as well as opening a London Oxford Street shop overlooking Topshop’s megastore on the road. Today, Miss Selfridge operates in 25 countries on 4 continents and continues to enjoy success as a ‘go-to’ shop for women on the British high street. What lies next in store for this chain, no one knows – but it’s sure to be positive… and stylish! Miss Selfridges began as a small section in Selfridges Department store in London in 1966. Dorothy Perkins has great fashion and stores throughout the UK. Our guide will show you not only how to get a student discount code but also to save more. For funky affordable fashion New Look hits the spot and with some amazing discounts to be had they are always worth a look. 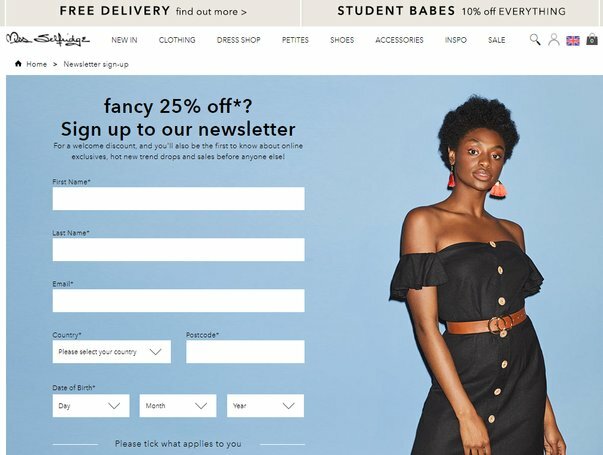 With an amazing website and great dresses, partywear and shoes, Boohoo.com has some amazing promo codes and ways to save. For more branded wear, check out Debenhams where they don’t have a student discount but they do have some tremendous deals. Or for a juicy 10% off, House of Fraser stocks quality brands from Ted Baker to Calvin Klein. Remember to check out Student Discount Squirrel for the latest ways for students to save.